Previously we have discussed mining profitability in Amazon Web Services (AWS) in regards to CPU and GPU mining. If you have not read the previous articles you may want to browse them. This article will be building on the CPU and GPU mining profitability articles. I know, it is like the first day of class and the teacher assigns homework. Based on the interesting findings in the CPU and GPU testing I was curious about rig renting. Rig renting is where you buy rig time and reap the coins during that time. Taking a quick survey of the rig rental landscape for Cryptonote v8 rental costs I found cost to be ~$0.40 USD per 1 kH/s per hour. Many rig rentals are paid in bitcoin or other coins and currently coins are volatile. So, when I say a rough estimate I mean rough. Cyptonote v8 was chosen as it is the most recent fork for some cryptonote coins which also includes bulletproofs. Bulletproofs lower transaction cost be decreasing blocksize. Webchain already has a low transaction cost so comparing to Cryptonote v8 rigs seems to be the best comparison. Webchain uses a special algorithm forked from CryptoNightV7 and altered to be CPU friendly, GPU difficult, and ASIC resistant. Why not compare directly to an existing Webchain rig rental? Because there are no Webchain rig rentals. Okay but why Webchain? Quite simply because it is currently the most profitable CryptoNight coin to mine. Mining Webchain at 1 kH/s hash rate for 24 hours yields about 174.131 WEB or roughly $0.58 USD. A Webchain coin (WEB) is worth about $0.0033 USD. Solo mining at 1 kH/s will yield a block find about every 6 hours and 20 minutes. The reward for a block find is currently 47.652 WEB. So, Webchain was chosen for profitability as well as minability. This should provide a good starting point for rig rental versus AWS mining. Using previous results from CPU and GPU mining profitability on AWS as a starting point, determine current data for Webchain. A base image for testing was created on Ubuntu 18.04. The instructions for creating the base image can be found here. The AWS instance used was a g2.8xlarge which was determined to be the sweet spot for GPU mining based on hash rate to cost. This provided 4 NVIDIA K520 GPUs at 300 H/s. The CPU (Intel Xeon E5-2650) hash rate for this instance type is also good at ~40 H/s per CPU. AWS allows for the selection of threads per CPU so this was adjusted to 20 out of the possible 32 to fully utilize the L3 memory of 40MB. 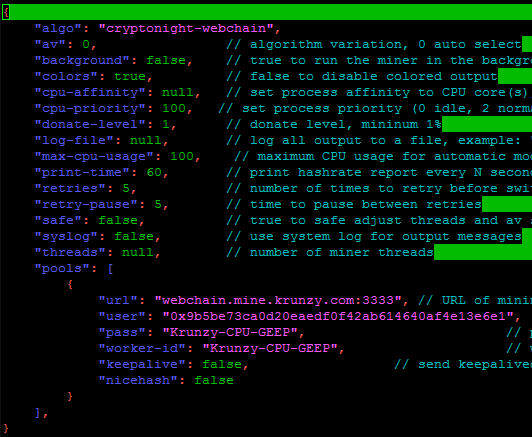 Testing was conducted through SSH on the g2.8xlarge instance with a cost of $0.78 USD / h. A session for CPU miner and GPU miner were created to easily track hash rates. The experiment was conducted for 90 minutes to allow the mining pool to provide accurate hash rates. The data collected included hash rate as well as some power costs. The hash rates remained fairly consistent over the experiment within 20-40 H/s. In this experiment, 2 x CPU Intel Xeon E5-2650 were used. This is based on number of threads where one CPU has 16 threads. The 20 threads were selected from 32 threads available making the CPUs used equal to 2. The wattage per CPU of 95W was taking from these specifications. XMRIG reports GPU wattage of 80W per GPU as per Table 1. The total cost per hour would be $0.78 for the g2.8xlarge instance. Presumably this is covering the power cost of $0.043. The cost per kH/s is reported pool hash of 1.5 kH/s normalized to 1 kH/s which is $0.52 USD/ kH/s. As mentioned previously, mining Webchain at 1 kH/s hash rate for 24 hours yields about 174.131 WEB or roughly $0.58 USD. A Webchain coin (WEB) is worth about $0.0033 USD. Solo mining at 1 kH/s will yield a block find about every 6 hours and 20 minutes. The reward for a block find is currently 47.652 WEB. In a game of pennies a nickel is a lot. Profitability is influenced by coin value and the cost to create a coin. Webchain does not have much value currently at a third of a penny. So, producing WEB is costly. In fact, the energy costs outweigh mining WEB currently. But that’s not why the experiment was run. We want to answer if AWS mining is viable compared to rig rental. Simply, AWS mining is over a dollar more per hour on average compared to rig rental. Is a dollar difference a lot? Absolutely when dealing with low margins. The rig rental seems the way to go for now, however, there are no Webchain rig rentals that were found at the time of the article. Which puts Webchain mining back to your own rig or setting something up in AWS. If you believe in the future value of WEB then this cost may be acceptable but a straight purchase would be cheapest at this time. So, when does the break even point happen? Let’s make a few assumptions based on the current data. It takes 6.33 hours to produce 47.652 WEB on average. Normalizing to WEB produced per hour we get 7.528 WEB/ h. Also, based on 1 kH/s the power cost alone is $0.043 USD /h, AWS mining is $0.58 USD/ h, and Rig Rental is $0.40 USD/h. With assumptions in hand let’s crush some numbers to find the break even values. Running your own rig and paying only power costs based on the AWS setup is 10x cheaper than renting a rig. A little more than half a penny will be break even for your own rig and a little while back WEB had reached $0.007 USD. But not everyone can afford to purchase or maintain a rig. With no expertise and the will to mine a rig can be rented. To break even, the cost of WEB would need to reach $0.0531 USD/WEB to make a rig rental viable. You can still roll your own and create a miner in AWS. To break even here, based on the current experiment, WEB would need to reach $0.077 USD. However, you read the CPU Mining Profitability article and you know there is a better AWS rig. Gold star for you! Webchain is mineable by CPU and not as good at GPU mining. We learned previously that we could spin up several cheap CPU instances in AWS. We then see a break even profitability of $0.05 USD also known as the shiny nickel. It is also at this point that AWS edges out the rental by $0.0031 USD/h. Remember, fractions of a cent are important in the game of pennies. Whether new to mining or an old pro, attention to cost to mine is just as important as a huge hash rate. Calculating the cost to produce a coin to its current value provides insight into when to purchase hash rate. Bigger is not always better if the costs are too high. You may actually be more profitable at a lower hash rate. If you like this article, please think of tossing us some coins to help pay for fluffernutters. Thank you. We have just completed the deployment of the new Krunzy Webchain Pool. 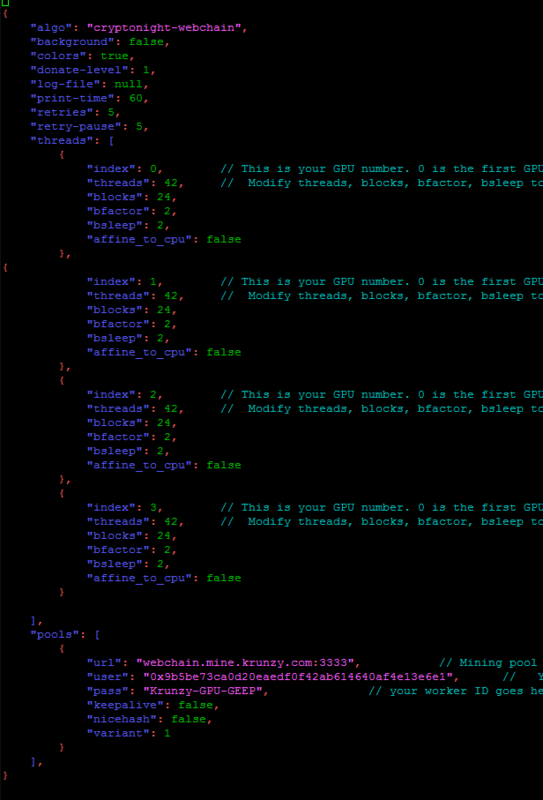 The pool is fully globalized and will auto select the mining pool closest to the miner. The web UI is also fully globalized making the site responsive from any corner of the globe. Please note, globalization is based on regional proximity. So, if the mining rig is in Russia but you access the web UI from Fiji you will not see your miner. This is because the globalization region is determined by request location. Please keep this in mind. Enriching the web UI started with the webchain-pool application’s UI. There has been some reskinning and additional instructions to help new users. Part of the reskinning was the addition of the new Font Awesome content delivery network (cdn) and refreshing of the fonts. Last, a Webchain widget has been added showing market information. Before any changes were made to the web experience, the new design had to cater to the novice entering the mining space. Webchain, which is CPU mineable, is definitely a gateway for new miners. To improve the new miner experience we improved instructions and increased the frequency of payouts. NOTE: At block height 2,022,222 Webchain will fork to a new proof of work (PoW). The new PoW is lyra2. Please make sure to have the latest webchain-miner to avoid interruption. A new wallet and daemon are also available. We really hope you like the changes and any constructive comments are welcome.